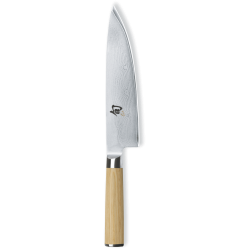 In the version with a light-coloured handle, too, the properties of these high-quality Shun Damascus knives naturally remain of the highest quality standard. They combine centuries-old Samurai forging artistry with cutting-edge Japanese manufacturing processes. The result is chef's knives that have been perfected down to the smallest detail and consistently designed for enduring sharpness - ideal for professional use. The blade is sharpened on both sides and has a core of extremely hard VG MAX steel (61 (±1) HRC). Encased in 32 layers of Damascus steel, each knife is given its incomparable anatomy with a stable blade which, thanks to the two components, is both hard and elastic. In keeping with the series, the light-coloured handle also has the traditional chestnut shape, making it comfortable to hold. High-quality resins added to the wood make the material exceptionally resilient and moisture-resistant. The forged tang ensures a perfect balance between blade and handle. This year the world-famous Shun Classic series is receiving a very special new addition: the handle was previously only available in black-brown, but in 2019 six selected blade shapes with a light ashwood-coloured handle will become an integral part of the series as Shun Classic White. al product: the SHUN Classc Krts..